LD Mike Billings Chooses 4Wall to Light Epic Musical 'The Prince of Egypt' | Press Center | 4Wall Entertainment, Inc.
Mountain View, CA- TheatreWorks Silicon Valley debuted The Prince of Egypt last month, a new musical by Stephen Schwartz and Philip LaZebnik. Inspired by the acclaimed animated film of the same title, the production is now the highest-selling musical in the 48-year-old theatre company's history. Lighting Designer Mike Billings was tasked with lighting the production with gear from 4Wall Entertainment. The scenery for the show was minimal - an irregular shaped "earth" platform and an overhead "sky" piece that was used as a projection surface. The lack of scenic pieces dictated the direction of the lighting design. "Other than some blocks and amazing choreography, those were the only objects that helped indicate location," said LD Billings." "A lot of responsibility was placed on lighting and projection to help tell the story, location, time-of-day, and emotional state." Given The Prince of Egypt's countless locations, Billings' goal was to create a vocabulary of color and texture to help the audience understand what location they were in, and help support the emotional content of each scene. "The effects in this show were of biblical proportions," explained Billings. "From parting the seas to turning a river into blood, I needed a rig that could support that and then some." Martin MAC Viper Performance fixtures answered the demands of the lighting design and were the workhorses of the production. "There was a giant ceiling piece that served as a projection surface and it limited most of the downlight/backlight possibilities, so these fixtures were hung as low side-lights to shoot under the ceiling piece," explained the LD. "They did an amazing job of cutting through the conventional rig, providing texture on the floor and lit the actors exceptionally well." For the water effects at the bank of the Nile, turning the river into blood, the parting of the Red Sea, and the fire effect for the burning bush, the fixture's animation wheels were essential. "The Viper's shutters were also extremely helpful and allowed me to create numerous looks," said Billings. "The show has a lot of dance and movement, so there was a lot of low side-light that cut off the floor. It was great having these as an additional system of bright side-light to cut through." 4Wall also provided Chroma-Q Color Force II LED battens which were used to light the cyc. "The individual control of 24-cells per fixture was essential for providing gradients and multiple colors," said Billings. "The show often had multiple worlds simultaneously onstage at the same time, so being able to seamlessly fade between colors in multiple parts of the cyc was important." 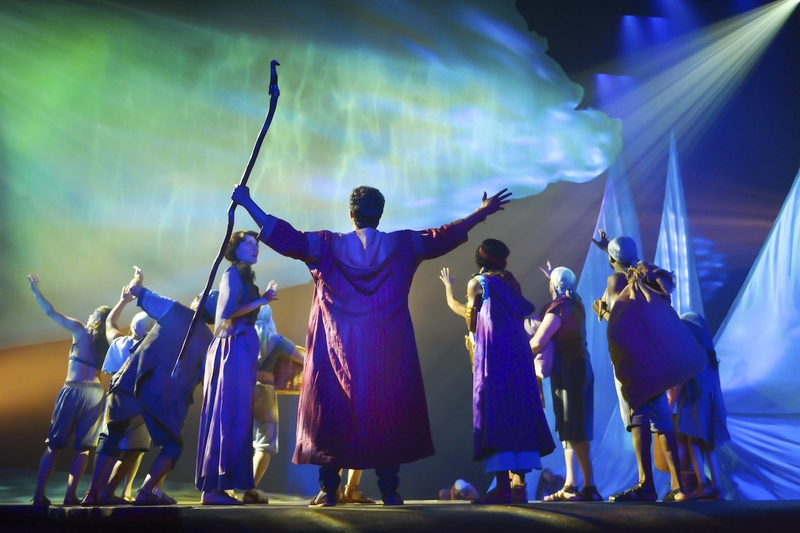 The Prince of Egypt animated film translated to the stage incredibly well, in part to Billings' lighting design and a 4Wall rental package. The LD spoke of the service 4Wall provided and thanked key personnel who made the show's success possible. "The service from 4Wall was excellent, as usual. I received a quote immediately from Craig Teague and he was able to meet our budget limitations. We got exactly the gear we wanted and it all worked flawlessly." Billing's continued, "Special thanks to the amazing lighting team at TheatreWorks Silicon Valley, led by Master Electrician Steve Mannshardt, Scenic Designer Kevin Depinet, and Projection Designer Shawn Sagady. Also, the amazing guidance and unique vision for this show from the director Scott Schwartz cannot go unnoticed." 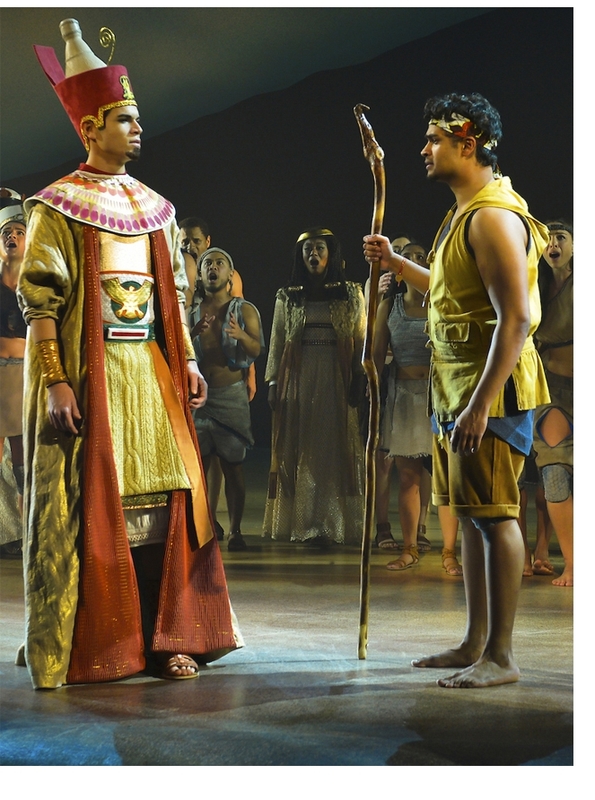 The Prince of Egypt, co-produced by Fredericia Teater, will next be re-mounted in Denmark for its international and co-world premiere in April 2018, accompanied with another Mike Billings' lighting design.